1 In shallow nonaluminum baking dish or plastic bag, combine soy sauce, sugar, sherry, garlic powder and ginger. Add shrimp, green pepper and water chestnuts; stir to coat. Cover, or close bag, and marinate in refrigerator up to 3 hours. 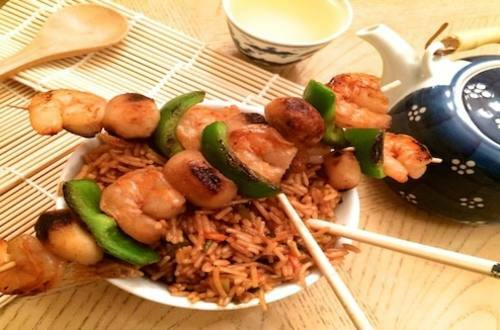 2 On skewers, alternately thread shrimp, green pepper and water chestnuts. Discard marinade. Grill or broil, turning once, until shrimp turn pink. Serve with prepared Knorr® Asian Sides™ - Teriyaki Rice and, if desired, steamed snow peas or broccoli and fortune cookies.